Crane number 60 got a bit misplaced earlier in the week. Apparently my cat and I were fighting (unbeknown to me), and she decided to defile my purse. My purse got a one way ticket to the trash can. 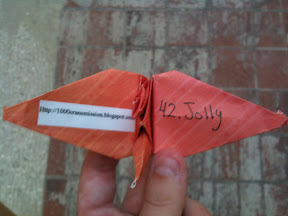 I thought this crane had gone with it, but I came upon it yesterday in the cup holder in my car. So I decided to place it immediately to make up for the gap. Silly crane! I'm not sure I can relate the word back to the story that I want to tell about this location. But I worked at this beach for every summer for nearly 7 years. This past summer was actually the first I didn't work down there. What a great job it was: sitting in the sun (with 50spf, thank you fair skin! ), reading books, all whilst getting paid. I met a number of wonderful regular patrons that treated me wonderfully. It doesn't get much better than that. Not to mention this was the beach of my childhood: making sand sea turtles & castles, watching the fireworks on the 4th of July (American Independence Day), playing video games in the arcade (which was much larger back in the day). It was the beach the my Granny took my Dad and his siblings to when they were little. So it's a beach with a lot of history and one I'd have to call my own. When I was younger, my Grandparents used to pack me into their car and we'd go for drives. My favorite drive was always through Deal, on the ocean, to look at the big houses. Even back then, I loved to see all the different colored houses with their pretty landscaping. The streets leading from the beach all seemed to be tree-lined and as story-book wonderful as my little mind could imagine. I was pleasantly surprised to find it still was the case. I've long since outgrown drives with my Grandparents, but the houses are just as majestic as I remember. The streets are still tree-lined in that old fashioned Southern looking way. Not a cookie cutter house in sight. A coincidentally placed crane. I went into the bank feeling, well, ecstatic since I was cashing in my first certificate of deposit (CD). It wasn't so much the $20 that I had gained off of it in the nearly 2 years the money was sitting in there that made me ecstatic. It was the fact that this was my first "adult" investment; this CD was my first non-checking/saving account as a way to diversify my portfolio (baby steps.) I was proud of myself for having researched and signed up for one back when I got it, for taking a step in the right direction. So today I cashed in my CD. And that, my friends, makes me ecstatic. Is there anything that makes you happy, even though it's not necessarily something another perhaps would be as excited about? Of course we all want the ATM to be a bit more generous with us than it is. I can't be the only one to harbor the dream that it will spit money at me like a slot machine when I put my debit card in, am I? To date it has not yet happened, but I'm keeping my fingers crossed in the future. This one found its way on to one of those middle of the floor tables next to a couple books I was looking at picking up. I thought it was a good place for it. But now this mall isn't the closest one to me and I visit it far less frequently. Since I moved, they've completely revamped its look in a better way (except for the choices in the food court, which I am not pleased with.) Going there still feels like a little piece of my past though. Do you have any place like that? A place where, no matter the amount of time that has past, you feel like you're "home?" If you include your email address in the section for it, I'll respond back! If you had a crane to place, where would you place it? I've been trying to think of places I could actively release cranes instead of just releasing them where I go. I've got a small list of places but I wanted to hear where you would place them (by you or in general.) Does a certain place hold significance for you in your area? Is there somewhere you'd want to place one but no longer can? I'd love to hear your thoughts on placement! Hope you all have a great day. I think we've all learned how much of a bookworm I am/how often I frequent establishments that house books. No surprise that I found myself in another one. With a bookstore in nearly every town, coupled with my weakness for bound books, you'd understand why the swipe part of my reward cards are a bit worn. The only thing I can say about this one is that I did my best respect all the people having their Monday night caffeine fixes. Starbucks is one of those seldom treats I give to myself since I am not a coffee drinker. And I certainly did appreciate my ice beverage. I figured it would only be fitting to leave a crane where I am purchasing all of my paper. So I placed this one on top of the pad of paper that I ended up buying. Now all I have to do is cut it to size (from the 12x12 sheets into 6x6 sheets) and include it into my paper rotation. Between this pad and the one I've currently been using, I should have more than enough bits of paper to carry my through to the end of my 1000 crane mission. But speaking of success, I wanted to say how pleased I am with the way my project has been turning out. It has surpassed my expectations both in terms of followers and the positive responses I have been getting back about it. A blog is not a success (at least in the terms of my project) without followers. So thanks again for sticking with me on my journey. When I was younger, my family went to this park regularly. Lots of good memories here of panning for sharks teeth, paying on the swingset, drinking Dr. Pepper and feeding the ducks/geese (where they occasionally stole what we were feeding them.) I remember it being very serene back in the day. It's changed a fair amount since those days but it won't change the pleasant memories. I've always seen this Farmer's Market while heading to the library, but had never ventured in. But today I was finally in the area when the market was open. What a treat. I'm excited to go back again and pick up some of that Apple Pie jam when I have some sort of method of payment on me. 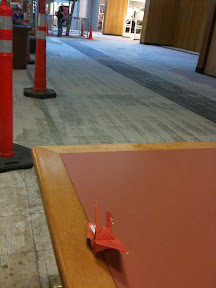 If you notice, I chose a very special book to place this crane next to. 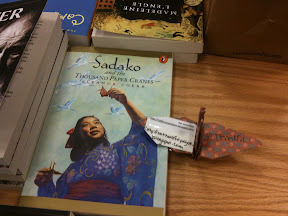 I am extremely thankful for the book Sadako and the Thousand Paper Cranes by Eleanor Coerr for being the inspiration in my project. This book was a considerably newer version than the one I picked up from the library. (I think I was most pleased to see that it was on the required reading table -or whatever the proper name is- for elementary school children.) If you've not read it, I highly recommend you do. It's a short but inspiring read. I was tempted to wait until Thanksgiving to do this one to talk mention all I am thankful for, but decided that I am not only thankful on Thanksgiving (celebrated in the United States on the 4th Thursday in November.) I am thankful every day, in the least corny way possible. I wanted to take a little time to thank you, my followers/readers/people stopping by. I appreciate all the kind words, help and suggestions you've given me. So thanks everyone! 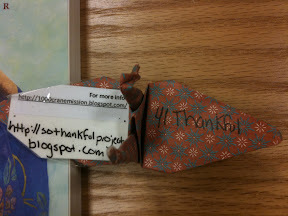 I also wanted to thank my friend Julia of The "Thank You" Project. She gave me a fair amount of help when I was in the very beginning of my project. So much thanks to you as well! So, readers, what are you thankful for?